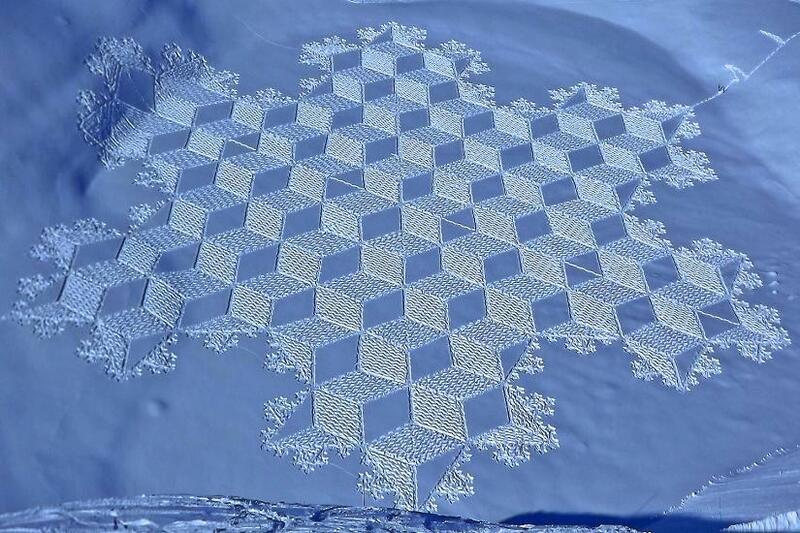 Snow artist Simon Beck has recreated the famed Milk Hill August 2001 ‘galaxy’ formation in sand. As near as we can tell it’s full-size, too. Okay, so it’s not quite the wheat extravaganza those folks at the Crop Circle Challenge are expecting, but we still consider it an impressive feat, especially for one guy working on his own (!). This formation has been recreated twice in sand before – by croppies Jo and Troy Byrne on a beach at Gerroa, Australia (midle photo) and by unknown artists in the UK (bottom photo). This entry was posted in 2001 Aug 14 Milk Hill, Crop Circle Challenge, Jo Byrne, Sand Circles, Simon Beck, Troy Byrne on May 25, 2014 by admin. In response to the Crop Circle Challenge, The Barge Inn have issued a cheeky challenge of their own. The requirement? Recreate the August 2001 Milk Hill ‘galaxy’ crop circle. The prize? 100,0000 pints of Croppie Ale. The conditions? Only aliens are allowed to enter. Full details here; screen captures below. This entry was posted in 2001 Aug 14 Milk Hill, Alien Crop Circle Challenge, Barge Inn, Crop Circle Challenge, Croppie Ale on February 27, 2013 by admin. Crops aren’t the only canvas for ‘the circlemakers’; herewith some lesser-known media. This entry was posted in 2001 Aug 14 Milk Hill, 2001 Jun 21 East Field, 2002 Jul 18 Windmill Hill, 2002 Jul 4 Stonehenge, Sand Circles, Simon Beck, Snow Circles on April 17, 2012 by poppy amersham. Well we weren’t wrong in thinking that the Waden Hill formation (see 26th April news below) boded well for the 2008 season; the crop circles have been coming thick and fast this year, some of them rather rubbish but most of them exemplary, all interesting in their own way, and providing what we think has been the best season for a good few years. The overwhelming majority of this year’s formations have been in Wiltshire. We wonder how much this is to do with Wilts’ fecund fields, how much that a circle not in Wilts would not be made note of, how much any person / force making a circle knows both these things. One formation which wasn’t in Wiltshire, and which we think is of particular note, is this one (image by Peter Sorensen) which appeared very close to Weyland Smithy in late July. Why do we find this circle so notable, you ask? Firstly, the curious way that it’s been largely neglected despite the fact that it’s big (Joe Croppie good formation denominator A) and complex (Joe Croppie good formation denominator B) and geometrically eloquent (Joe Croppie good formation denominator C) and suggestive of what is to come (Joe Croppie good formation denominator D) and probably references 2012 or eclipses or something (Joe Croppie good… okay, now we’re being flippant), and but a few seasons ago would have been a contender for formation of the year. We’re not sure how big it is overall; we’d guess c.350′ to c.400′ from tip to tip, the majority of which is flattened. Count the circles; there are 241 of them. Only Milk Hill 2001 – at 409 circles – beats it (it’s true, of course, that the Windmill Hill July 1999 formation – at 288 circles – also beats it on a strictly numeric level, but we’d class that as 288 grapeshot, which we don’t think is quite the same). The other – and for us far more significant – thing about this formation is something that appears to have pretty much gone unnoticed. It effortlessly presents a total revolution in crop circle laying out. Formations of this style – myriad circles delineating a pattern – always have underlying pathways joining the circles. Whether you deem them construction lines or guider-paths put there by the circlemakers to point the way through the formation (a curious perspective that seems to be still held by few but Michael Glickman), both 1996 Julia Sets, the Milk Hill 2001 formation, and myriad other formations have them. This one doesn’t. This formation has no underlying pathways whatsoever. Every circle is free-standing, yet still they all lock together perfectly. The 2008 season will continue, of course, and we expect more circles to be dropping into fields as you read this (unless you’re slack and reading this in September, in which case only stubble and best wishes remain). We’ve not had a finale yet by any means. This entry was posted in 1999 Jul 19 Windmill Hill, 2001 Aug 14 Milk Hill, 2008 Jul 27 Weylands Smithy, 2008 Season, Michael Glickman on August 13, 2008 by poppy amersham. Wildly over-estimating the size of formations seems to be sadly common in crop circle research. We’ll avoid getting Freudian as to why this might be, but will say that it works in reverse as well – formations which croppies don’t like and / or consider man-made are sometimes claimed as being smaller than they actually are. Take the Milk Hill formation from August 2001. Firstly we should say that we consider this formation a staggering achievement. 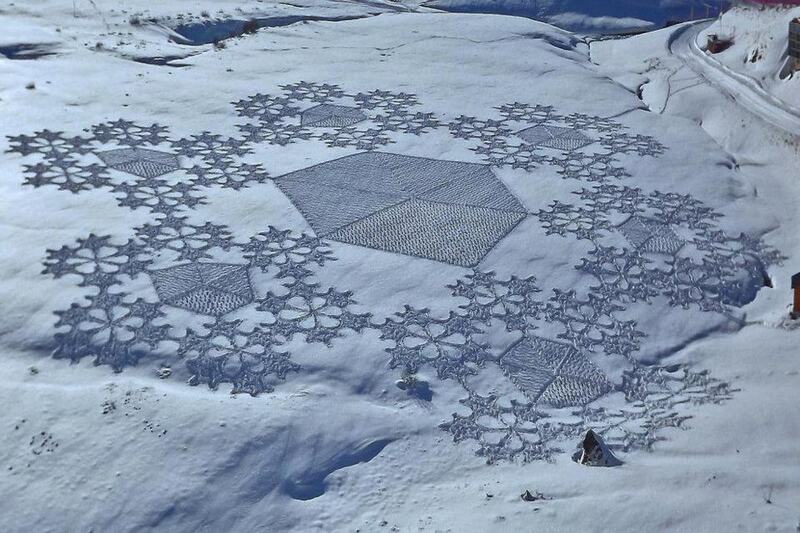 It has rightly earned its place as one of the finest crop circles ever. It is, of course, also very large. We’ve often seen this formation listed as being 1,000′ across, and have even seen it listed as 1,500′. So how big is the Milk Hill formation, exactly? Andreas Mueller surveyed this formation and put its overall diameter at 787′. Peter Sorensen didn’t measure the formation but did phone the farmer to ask how widely spaced the tramlines in the field were. From this figure – 24 meters – Peter counted the number of tramlines the formation spanned and estimated its overall size as 767′, which is only 20′ different to Andreas Mueller’s figure. Therefore the claims that this formation is 1,500′ are over 100% inacurate. Even claims that it is 1,000′ are out by more than 200′. We don’t understand why croppies feel the need to do this, particularly in the case of the Milk Hill formation, which is more than impressive enough as it is without the need to lie about it. Let’s take another example, the formation which appeared at Woodborough Hill, Wiltshire on 11th July 1997. Judging from the tramlines (aerial shot below) we’d guess this formation to be approximately 300′. 300′ seems to be the general concensus on this formation’s diameter, from what we’ve read, with one notable exception; in an interview with Linda Moulton Howe (in her book Mysterious Lights & Crop Circles, page 60) Charles Mallett says of this formation “it was huge, a quarter mile across”. A quarter of a mile? Charles, what on earth are you on? A quarter of a mile is 1,320′, which means your estimate is more than 1,000′ out. 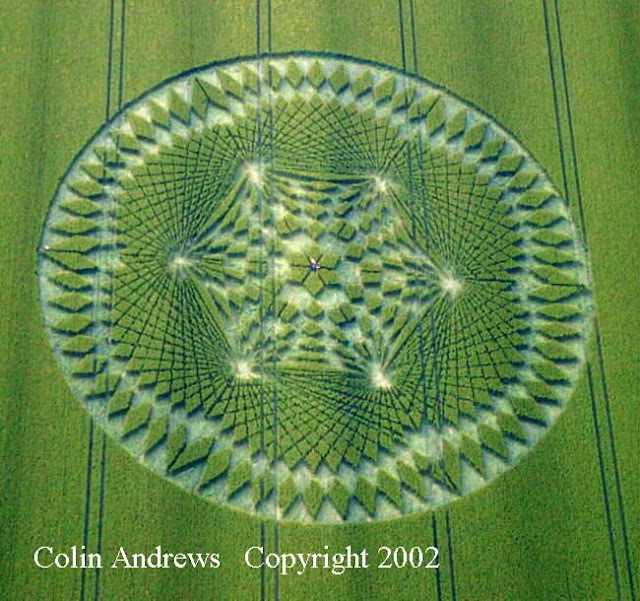 And you wonder why the general public don’t take crop circle researchers seriously, when they can’t even get basic stuff like that right? Woodborough, July 1997. 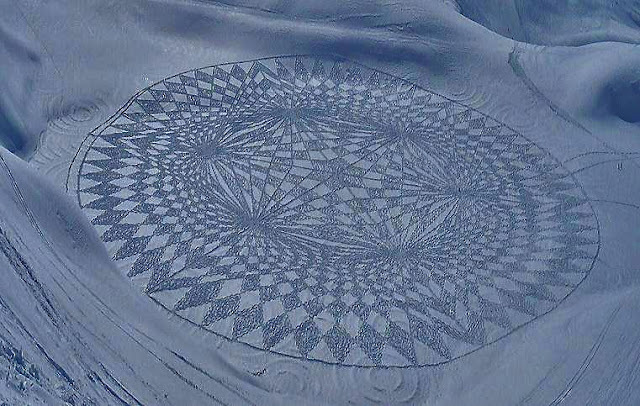 Not a quarter of a mile across… It’s amazing how far crop circle design has progressed over the years. When this formation appeared it was praised for its extreme complexity, but it’s really nothing more than twelve rings equally centred around the perimeter of a circle half the diameter. That said, we do find it a very striking formation. We remember attending a lecture some years ago by Andy Thomas, in which he stated that since the famed East Field pictogram of 1990, there had been a formation of high quality in East Field every year (he appears to have forgotten 1995, in which East Field didn’t have any circles at all; the only year that hasn’t happened since 1990). When it came to 1997, however, Andy’s quality East Field formation was this one at Woodborough (which was in the field directly opposite East Field, Andy’s argument being that it was ‘pretty much East Field’). Which means that (a) Andy chose to ignore the actual East Field 1997 formation – which was, it has to be said, a horrific mess; see aerial shot – and that (b) he lied about the evidence to fit his theory. Both aerial shots by Lucy Pringle. We suspect that the croppie obsession with making formations out to be bigger than they actually are is in part due to the notion that the larger a formation is, the less likely it is that people made it. However, this ignores the fact that there are a number of known man-made circles in the 300′ range (for example the Avebury 29th July 1999 Daily Mail comission, or the Sorensen/Russell/Hein Hilmarton formation of July 2001), and even a few around 500′ (for example Cranford St Andrew, 1st August 1992 – see photo – which dwarfed every other formation that had appeared up to that point). Other croppies, amusingly (yes, Colin Andrews, we’re thinking of you specifically though you’re not alone in this) think quite the reverse; the larger and more complex a formation is, the more likely it is to be made by people. In part we suspect this is down to said researchers harking back to a hypothetical golden age when the bulk of the designs in the fields were small and simple and croppies could get on with their research without all those evil ‘hoaxers’ around to spoil the fun. One of our favourite small formations of recent years is this one, which appeared (in amongst a series of dumbbells) near West Overton, Wiltshire, in July 2006 and which measures approximately 15′. A thing of great beauty, in our opinion, looking delicately hand-sculpted (and we suspect it probably was in a literal sense). Note the way that the flattened crop seemed to curve up the sides of the perimeter. However it has all but been ignored by the majority of researchers purely – we suspect – due to its size. Perversely, the people we know who most like it are circlemakers. What does that say? Perhaps because they see beyond the ‘bigger is better’ mentality and can appreciate it for what it is. This entry was posted in 1992 Aug 1 Cranford St Andrew, 1997 Jul 11 Woodborough, 1997 Jul 31 East Field, 1999 Jul 29 Avebury, 2001 Aug 14 Milk Hill, Andreas Muller, Andy Thomas, Charles Mallett, Colin Andrews, Daily Mail, Linda Moulton Howe, Mysterious Lights And Crop Circles (book), Peter Sorensen on August 13, 2008 by admin.